Crystal jewelry is the perfect way to add a little sparkle and color to your outfits, whether you're on a date or out with your girlfriends. 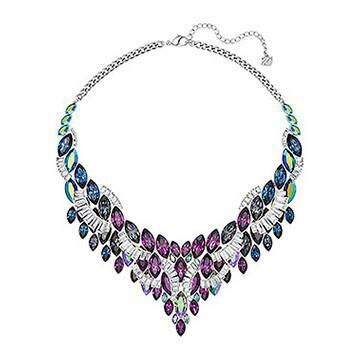 You can find bracelets, earrings, necklaces, and more in stunning crystal styles. In general, you can find crystal pieces to fit almost any budget, too. This Swarovski Cosmic Necklace, at first glance, appears to be something you'd only wear with the most elegant of outfits and special events. However, imagine it paired with a maxi dress and chambray shirt or denim jacket. The rich blues, greens, purples, and white would pair beautifully with the bolder shades of fall and winter, casual or dressy. It is available for approximately $400.00. The Cristabelle Crystal Choker Necklace from Nordstrom would also pair well with anything, and it would look especially interesting when paired with a longer necklace with a scoop or v-neck top, though it could also stand alone with a little black dress. This design is just over $50.00. The Eliot Danori Raindrop Crystal Earrings from Macy's will pair well with anything except your most casual of outfits. They're less than $50.00, and thanks to the dangle style and sparkle, will draw more attention to your face. They have a drop of about 1.5 inches, the perfect size to play well with other jewelry without blending into the background of your overall ensemble. The Crystal Radiance Rainbow Corkscrew Earrings from Kohl's show just how much fun crystals can be, with crystals in blue, green, orange, and pink set in silver-plated brass. Expect to pay around $75.00 or less. The Swarovski Fun Ring is named appropriately. It has a whimsical vibe mixed with sophistication, and it will only set you back around $200.00. 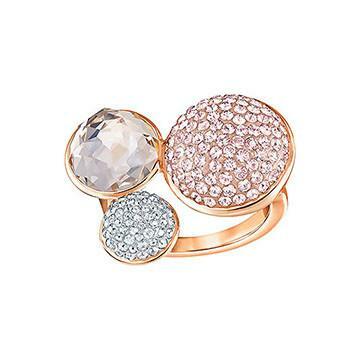 Choose from blue-toned crystals and palladium plating or rose gold plating with a mix of delicately colored stones. Each ring has three spherical designs in three different sizes. This design will go with anything. The BP. Stacking Rings Set of 5 from Nordstrom allows you to mix and match the rings to customize your look. These combine gold-tone metal and stones for less than $20.00. 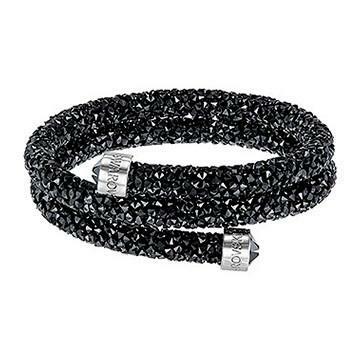 The Swarovski Crystaldust Bangle Double in Black, which is less than $100.00, will turn heads and pair up nicely with anything from dressed-up blue jeans to a little black dress. It's available in five other dazzling colors, including blue, white, gold, black/silver, and gray. Choose from small or medium to fit your wrist. The Vieste® Crystal Lace-Look Bracelet from JCPenney is an elegant piece that will add an extra touch of beauty to your dressier ensembles, but it only costs around $20.00. It's done in silver-tone metal and has clear crystals, and its overall appearance is that of sparkling lace. The 1928® Gold Tone Crystal Floral Brooch from Kohl's (under $30.00) is reminiscent of yesteryear's jewelry. The pink Austrian crystals here aren't front and center, but instead serve to highlight the overall shape of the brooch. Pin it on a sweater or hat, or use it on a scarf or wrap. It's about two inches long, so it's large enough to be a conversation starter if paired with solid colors it won't get lost against. For something a little more unusual, there's the Buzzing Bee Brooch for just under $40.00 at Bling Jewelry. It's about 1.25 inches by one inch and will be right at home on your scarf, sweater, or denim jacket. It features clear, citrine, and orange pave set stones. You can find crystal jewelry in almost any big box or department store. Before shopping, decide what colors (including metal) you want your jewelry to have. Even if your budget isn't very large, at least spend a few moments searching a variety of department stores' selections online, since crystal jewelry isn't always expensive and is quite often marked down. Check out mall stores for teens and young adults, like Forever21 and Charlotte Russe as well, because they tend to have trendy styles at incredibly affordable prices. If you like your crystal jewelry to be layered with other pieces, these stores will make it easy to put a whole new jewelry look together without going broke. If you'd like just one or two higher end pieces that will last several years and aren't so worried about following the trends, specialty stores like Swarovski and other jewelry retailers are a good place to start. You'll find pieces with crystals that could pass for diamonds, without the high diamond price. The beauty of crystal jewelry is its versatility. Yes, they sparkle and can dress up an outfit, but the pieces also don't always feel like they should be reserved for special occasions the way diamonds and pearls might. Layer crystal chokers with longer pendants, stack bracelets and rings, or throw a pin or brooch on last-minute when you put on your jacket or scarf. Do vary the sizes of your pieces (don't wear statement earrings with a statement necklace, a chunky ring, and a wide bangle, for example). As with most jewelry, remember that less is usually more. Pair crystal pieces with mixed metal pieces or even leather jewelry. There are no rules. It all depends on your personal style, what you're wearing, and the style of a particular crystal piece. Be gentle with your crystal jewelry. To clean it, use a soft cloth (damp, if you feel that it needs to be) to polish it, but never submerge it in water or detergents. Remember that these items aren't meant to be worn in the shower, pools, hot tubs, while washing your hands, or even when you're applying products to other parts of the body (such as hairspray, perfume, or soap,). Treat these pieces delicately and they'll maintain their shine and beauty much longer. Always store your crystal jewelry in a safe place, such as a fabric-lined drawer of a jewelry box, away from other pieces that could get tangled with it. The range of styles and prices in this type of jewelry mean there is a look for every woman. Whether your style is bold or understated, jewelry accented with crystals offers a touch of sparkling style that will enhance your look in a fresh way. Choosing pieces you love and caring for them properly means you'll have that extra added touch of glittering style whenever you want it.